Customer target board for PIC18F1230/1330 devices. The target board should have an 18-pin DIP socket to connect to the 18-pin DIP socket on the debug header. PICDEM™ MC motor control demo board. Use the 28-pin DIP socket on both boards to mount the debug header on to the PICDEM MC board. PICDEM™ MC LV motor control demo board. Use the 28-pin DIP socket on both boards to mount the debug header on to the PICDEM™ MC LV board. The following sections detail the configuration of the jumpers on the debug header for use with the above mentioned boards. The default configuration is to remove all jumpers. S1 is not populated and should not be used. Connect the header to the target board. Power the target board. You should see the red LED on the debug header turn on. Connect the debug tool to the debug header. Use MPLAB® X IDE and the debug tool to develop your application. 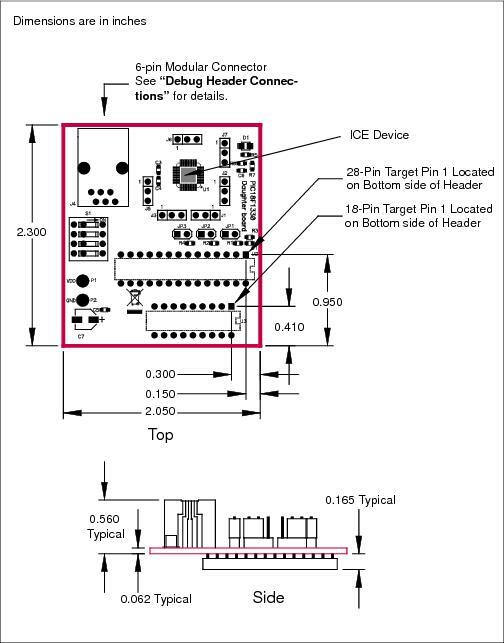 Connect the header to the PICDEM™ MC/MC LV target board. Program the part with the demo code. Press and release switch S2 on the target board to toggle the direction of the motor’s rotation. Press and release switch S1 on the target board to toggle between running and stopping the motor. If the motor stops while reversing from a high speed, there could be an over current condition detected by the system. Reset the system to run the program again.